Winter hibernation is close to setting in so here are a few of our places to hide out from the elements: They all happen to have beer...coincidentally. Quenchers - Like the Map Room: this is a great bar for beer lovers. Not like the Map Room: there is the added benefit of food service and either live music or comedy almost every night. Like the Map Room: they have pretzels. Not like the Map Room: they are big soft pretzels and you have to pay for them. Like the Map Room: cash only. Not like the Map Room: not sure if they have an atm (but there is a gas station right across the street). If you want a true "Chicago" experience, try their $1 shots of Malort - available everyday. You will regret it. Red Door - We've mentioned this place before but it's great: close, warm, good food, good cocktails, it's a solid neighborhood spot if a mixed drink is perhaps more up your alley than a draft beer with a german name you can't pronounce. We are no strangers to winter weight, so why not start it off at the Chicago Fine Chocolate Show? November 16-18th, general faqs and ticket information can be seen here. 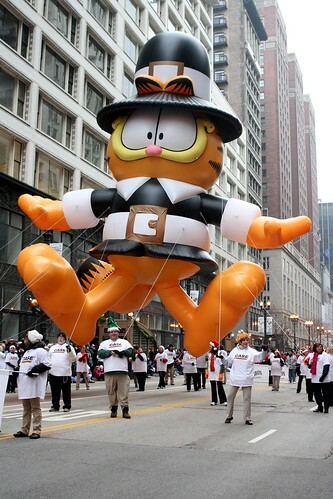 It's crazy, but Thanksgiving is only a week away, so we are all getting excited for the food, the football, and of course the parade (subtly named the McDonald's Thanksgiving Day Parade...I wonder who sponsors it?). If you want to catch a glimpse of Arthur, Mr. Potato Head, Curious George, the Gingerbread Man, Tom & Jerry, Mighty Mouse, and more then hop on the Blue Line straight from Ray's - you can get there easily....and escape easily. Starts at 8am Thanksgiving morning. -and agent Dana Scully from the X-Files. We also had on hand mustached on a stick for those guests who wanted to get in the spirit. Gracing us with his presence for about a week, Ray is spending his time at storage unit auctions, thrifting with a vengeance, and trying to keep his entire staff from having a quarter life crisis all at the same time.